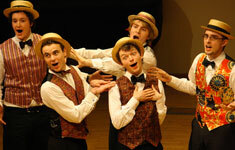 We are a vocal education charity – run by a group of dedicated volunteers – which organises workshops, events, competitions and other projects for singers of all ages, abilities and backgrounds. We operate across the UK, from London to Birmingham to Edinburgh. 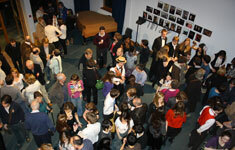 We started the Voice Festival UK in late 2007 when the UK a cappella scene was truly in its infancy. 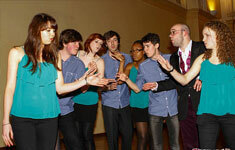 Our aim was to support and develop the national a cappella network and help it to grow. We started small: just 2 volunteers, one programme (University competition and workshops), and about 8 participating a cappella groups. Since then, we have grown as an organisation in response to the growing and thriving scene. We have 3 directors, a core team of volunteers, and are supported by several others who help out throughout the year. There are 3 separate programme strands to suit the needs of those involved, and we now work with around 60 a cappella groups across the UK every year. To find out more about what we do now, please explore our various programme pages. With each year getting bigger and better for The Voice Festival, we can’t wait to see what lies in store for next year and beyond. Every time we have a team strategy meeting (3 each year to be exact) we get excited about what the future might bring! We’re always looking for ways to improve what we do to ensure we continue to achieve our aims, and look to our participants, performers, patrons and volunteers to help us with this. So if you have any ideas, please ‘Get in Touch’, and if you want to get involved yourself, please see ‘Support’ for more details. We would love to hear from you! Since the birth of The Voice Festival UK in 2007, the team has grown rapidly. We have a number of volunteers who make up the main team and are the brains behind the Voice Festival. From masterminding flashmobs to providing the judges with their coffees, the team ensures all the events run smoothly and are accessible to everyone who enjoys a cappella music. Do you know who’s who on the Voice Festival team? Have you ever wondered how they got involved or whether they have any hidden talents?